Potter Wasps are solitary wasps related to the paper wasps. They build mud nests which they stock with caterpillars and grubs as food for the larvae. When the egg is laid they seal the entrance with mud. Size ia arounf 12mm, their habitat isWoodlands, heath and urban. 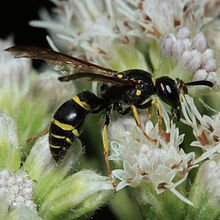 Potter Wasps feed on flower nectar and hunt caterpillars to feed their larvae.